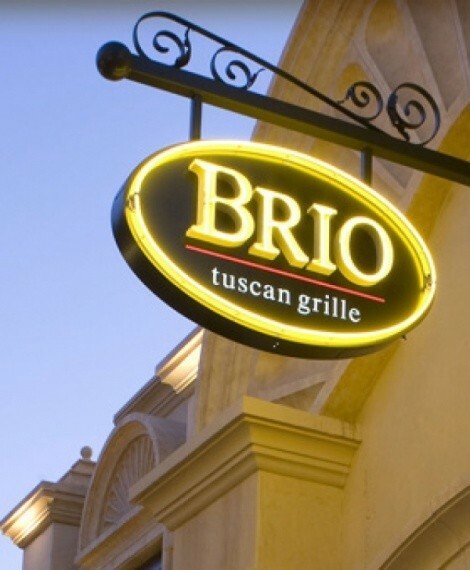 There are a lot of things to like about Brio Tuscan Grille, which opened a couple of months ago at Fashion Place Mall. Tuscan cuisine, however, is not among them. Look, I understand that Tuscany has a certain cachet. Books and movies such as Under the Tuscan Sun, Life is Beautiful, Tea with Mussolini, Tuscany in Mind, Stealing Beauty and even Hannibal have brought Tuscany into the American consciousness. However, not everything Italian is Tuscan. Perhaps someone should alert the folks at Brio Tuscan Grille to that fact. Actually, there is very little on the Brio menu that speaks of Tuscany. Tuscan cuisine is defined by its richness. Hearty bean soup called ribollita; thick pappardelle noodles; roast suckling pig (porchetta); wild game such as rabbit, deer and boar; and cured meats and sausages—these are the true flavors of Tuscany, and they are missing from the Brio menu. Granted, Brio does serve something called Bistecca alla Fiorentina ($26.95), but it’s made with strip steak, not the hefty porterhouse used in Tuscany, where the steaks can weigh over 2 pounds, be 3 inches thick, and are seasoned with nothing more than olive oil and garlic and perhaps a splash of balsamic, with maybe some lemon wedges on the side. At Brio, the bistecca is served with mashed potatoes, not the olive-oil-spiked cannellini beans or fried spuds you’d expect in Italy. So, now that you know what Brio isn’t (Tuscan), here is what it is: a very inviting restaurant with a pan-Italian, Mediterranean and American menu ranging from Naples (lasagna) and the United States (grilled salmon with shoestring potatoes), to Greece (grilled shrimp with orzo) and Milan (veal Milanese). In that sense, it’s not too different in culinary scope from places like Macaroni Grill, Carino’s and Olive Garden, although more expensive and much more appealing in terms of design and décor. For my money, Brio is really two different eateries. One I like; the other, not so much. There are a lot of soothing light brown, gold and cream colors at Brio. But the soft coloring and high ceilings don’t alleviate the noisy and chaotic feel of the main dining room, where tables seem crowded too close to each other. However, there is a different dining (and drinking) experience—a much more sedate one—when seated at an outdoor table or in the bar area, particularly at the comfy sofas and low-slung tables at the indoor/outdoor portion of the bar. That open, airy space reminds me of being in Las Vegas, Phoenix or Los Angeles. And there are other good reasons to plop yourself down in the Brio bar. For example, while in general, Brio is moderately pricy, there are astonishingly good bargains to be had in the bar. Monday through Friday from 3:30 to 6:30 p.m., and Monday through Thursday from 9 p.m. till closing, a “Tuscan Taster” menu is offered. Each item is priced at a mere $2.95 and there are $5 martini specials, to boot. Seated on a sofa, sipping a bottle of house Pinot Grigio (Tavolo Matto, from Veneto; $23) we went to work on some tasters. But first, we were brought warm bread, butter and flatbread—gratis, which is a nice touch—delivered by a very friendly and competent server, Sandra. Margherita flatbread ($2.95) was a generous-size flatbread pizza: thin, crispy crust topped with sliced tomatoes, fresh mozzarella and fresh basil leaves. Nice. Another good taster option is the Brio Burger ($2.95), which is a beefsteak burger topped with provolone cheese, cut into quarters and made even better with a serving of house-cooked potato chips. I don’t know where else you could find a good burger and chips like this for $2.95! Making friends with other folks on the patio around us—the cheap eats breed a friendly vibe—the couple to our left was raving about their pan-seared shrimp with Romano cheese-crusted eggplant and black-pepper cream sauce ($2.95). Meanwhile, we enjoyed a handful of plump, chilled shrimp with roasted-tomato cocktail sauce—served in a martini glass and called a “Shrimptini” ($2.95). But, seated at a regular dinner table, things got confused. The restaurant is still fairly new, and Brio servers—particularly the food “runners”—seemed to have difficulty matching orders with the correct customers. We had no sooner sat down when we were brought large wedges of iceberg lettuce with Gorgonzola, bacon, Roma tomatoes and creamy Parmesan dressing ($5.95), even though we hadn’t ordered them. I thought the salads just came with dinner and began chomping before discovering that we were indulging in salads the couple next to us had ordered. Oops! Anyway, it was a very pleasing, hefty salad—although I’m puzzled why it was called “bistecca insalata” which would translate as “beefsteak salad.” Maybe it’s a Tuscan thing. A beef-carpaccio appetizer ($12.95) was massive: a canoe-shaped serving dish nearly the width of our table with, literally, something like 30 or more paper-thin slices of bright red, raw beef, served with arugula, capers, mustard aioli and Parmigiano-Reggiano. Less appealing, by far, were three 2-ounce beef tournedos ($22.95) served on a bed of dry orzo with harsh-tasting slivers of red pepper, and topped with three breaded shrimp—called “scampi” for a reason I’m not clear on, since the bread crumbs were pesto-flavored. A grilled-shrimp and orzo entree ($19.95) wasn’t much better (same icky orzo), but I very much enjoyed a dish of homemade ravioli, stuffed with lobster and shrimp and topped with a creamy Limoncello-butter sauce, with arugula and lemon vinaigrette on the side ($19.95). Despite it not being Tuscany, I plan to return to Brio—often, in fact, because I really like the bar scene and the economical eats during the Tuscan Taster times. I suspect when word gets out about those good deals, that section of Brio will be buzzing. Just don’t look for me in the dining room.